Triple J, MJD Construction, and Best Deal/RNV routed their respective opponents in the 2018 JP World Corp. Customer Appreciation Basketball League last Saturday at the Gillette Multipurpose Gymnasium. 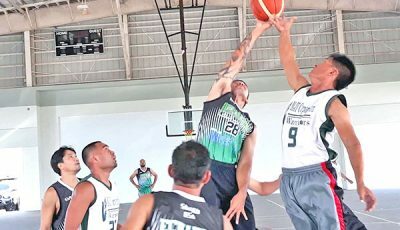 MJD set the theme in the triple-header after topping Coca-Cola in the curtain-raiser, 89-74, while Best Deal/RNV and Triple J also earned easy victories against Hawaiian Rock, 89-48, and D&Q/CTSI, 107-69, respectively. Best Deal/RNV posted the biggest winning margin of the night, as it started pulling away from Hawaiian Rock late in the second quarter and went for the kill in the third. Ahead by only four, 28-24, with a little over three minutes left in the second frame, Best Deal/RNV had a 10-2 windup to enter the halftime break with a 38-26 advantage. Ronald Rueda led Best Deal/RNV’s strong finish in the first half, scoring 12 straight points in the second quarter and 8 of the team’s last 10 in the late surge. 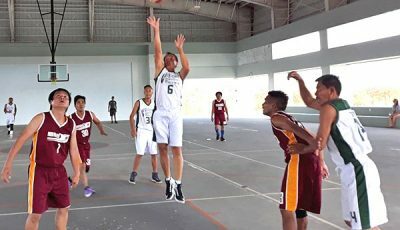 Rueda kept going and drew a lot of help from his teammates, as Best Deal/RNV more than tripled Hawaiian Rock’s output in the third quarter with a 26-8 scoring spurt for a commanding 64-34 advantage. Hawaiian Rock never attempted to cut the deficit to a decent number, awarding Best Deal/RNV a 41-point winning margin. Best Deal/RNV bagged its first victory, while Hawaiian Rock fell to a 0-2 mark. Meanwhile, MJD Construction outgunned Coca-Cola in the first half to establish a double-digit lead and matched its foes output in the second to make it to the win column after losing its debut. Cecilio Bisana drilled 9 points in the first quarter to lift MJD to a 22-13 advantage and then teamed up with Mico Usi in the second canto to pad their lead at the break, 48-33. Bisana added 10 more markers in the second quarter, while Usi chipped in 6. The lanky MJC player ended up with 30 points, while Usi finished with 16 despite failing to score in the first frame. In the last game of the night, Triple J opened a 25-15 lead over D&Q/CTSI in the first period and showed no mercy in the final canto with a 31-16 scoring surge to bag another easy victory. Triple J also whipped MJD in its first game of the season, 100-66. 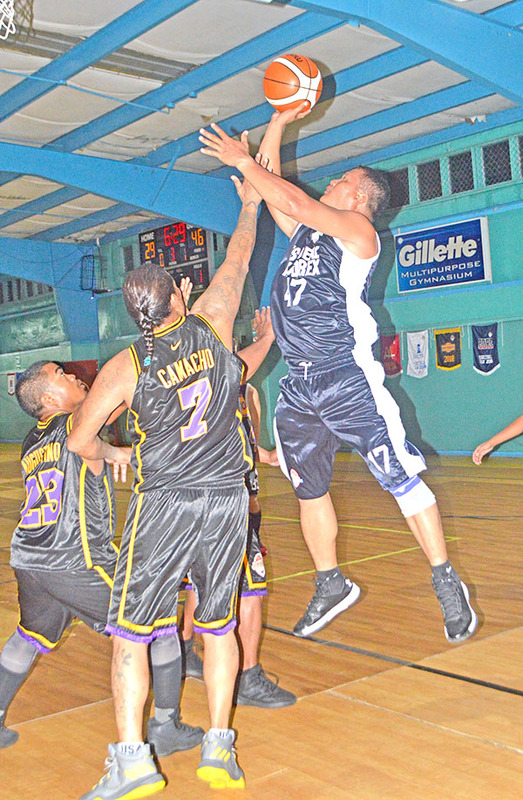 Triple J reached the century mark anew in its second game after running another balance offense. Eman Cobacha paced Triple J with his 24 points, Carl Aldan tallied 23, and Kenji Abobo added 16. Four other Triple J players hit at least two baskets apiece. MJD 89 — Bisana 30, Usi 15, Castillo 15, Rosario 6, Cabalquinto 6, Baretto 4, Deocares 3, Medrano 2. Coca-Cola 74 — Capalad 32, Armia 21, Nuique 5, Reyes 2, Felix 2. Scoring by quarters: 22-13, 48-33, 66-51, 89-74. Best Deal/RNV 89 — R. Rueda 36, Catindig 14, Motos 10, M. Tagle 8, Corpuz 4, Malenad 4, Jumaquio 2, J. Rueda 2, Alfonso 2, Corong 2. Hawaiian Rock 48 — J. Reyes 15, Pulsa 11, David 6, Baurile 6, M. Reyes 4, Camacho 3, Pacurib 2. Scoring by quarters: 14-11, 38-26, 64-34, 89-48. 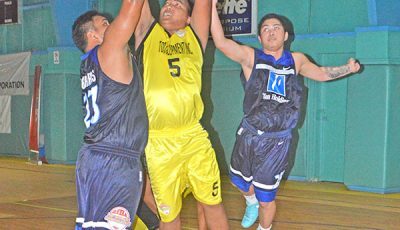 Triple J 107 — Cobacha 24, Aldan 23, Abobo 16, Patron 7, Mamaril 6, Oris 6, Geli 6, Inos 4, Cosager 4, Jarabe 4. D&Q/CTSI 69 — Rivera 20, Fujihira 18, Echavez 10, Nakashima 8, Tenepere 7, Benevente 6, Canete 4, Manalili 2. Scoring by quarters: 25-15, 52-33, 76-52, 107-69.